A classic example of a hard-luck mercenary unit, Gabhardt's Carabineers operated from the Second Succession War until their destruction during the Word of Blake Jihad. The unit experienced a something of a minor revival during the era of the Second Star League when it attracted the services of Vic Kantov, a disgraced ex-battalion commander in Wolf's Dragoons' Gamma Regiment who brought with him both a treasure trove of Star League and Clan-tech equipment and as well as former Gamma Regiment troops. While resulting in a spike in unit's Dragoon Rating, the expense of the upkeep of the advanced technology soon began to weigh down on the unit. Serving the St. Ives Compact during the later years of the Clan Invasion, as the Capellan-St. Ives War turned against the young realm the Carabineers drifted between various Chaos March factions before traveling to the Lyran Alliance's Periphery border. Based on Timbuktu, Gabhardt's Carabineers were deployed piecemeal over a half-dozen worlds, clashing several times with the mysterious raiders known as the "Green Ghosts" known to strike archaeological and religious sites up and down the border. Too thinly deployed and with the "Green Ghost" equipped with Clan technology, the Carabineers suffered increasing losses. Colonel Alexis Gabhardt was the commander of the Carabineers as of 3067 and the last living member of the founding family. Devoted to her people and the legacy of her family, Gabhardt has kept the command going far beyond the point any reasonable person would have admitted defeat. The unit's XO as of 3067 was Major Vic Kantov. When his battalion in Wolf's Dragoons' Gamma Regiment broke a contract with House Marik and engaged in acts of vandalism and looting in 3053, after the Mercenary Review and Bonding Commission fined the Dragoons one hundred million C-Bills and banned Jaime Wolf from battlefield command for a year, Kantov chose to flee rather than face the Dragoons' leader in a Trial of Grievance. Following a failed stint with Olson's Rangers, Kantov found a more comfortable niche in Gabhardt's Carabineers. Thanks to the skills that saw Major Kantov rise to the position of battalion commander in the Inner Sphere's preeminent mercenary command before his disgrace, under his guidance the Carabineers have evolved a tactical doctrine that uses their speed and mobility to deliver maximum firepower in pinpoint strikes. Unfortunately the unit's dispersed deployment during the Lyran Periphery contract made employing these tactics difficult on anything above company level. 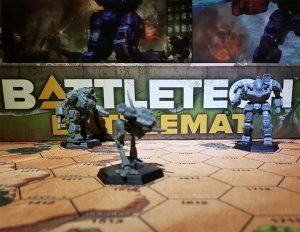 - A medium BattleMech regiment, each battalion is led by an independent command lance (heavy + assault designs), and an independent command company with (medium and heavy 'Mechs). 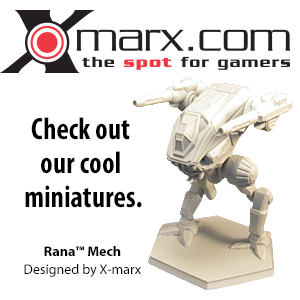 - A mishmash of hover and tracked vehicles, and a platoon of Sniper artillery. The Carabineers' emblem is a yellow shield bearing a white on red square. An archaic carbine is set horizontally set across both squares. The command uses a basic tan color in all environments. ↑ 1.00 1.01 1.02 1.03 1.04 1.05 1.06 1.07 1.08 1.09 1.10 1.11 1.12 Mercenaries Supplemental II, p. 34, "Gabhardt's Carabineers Unit Profile"
↑ 2.0 2.1 Second Succession War, p. 97 "Second Succession War Deployment Table - Draconis Combine Mustered Soldiery (DCMS) - Mercenary Combat Commands (DCMS)"
↑ 3.0 3.1 Mercenaries Supplemental Update, p. 12 "Mercenaries of the Jihad - The Rolls of Honor"
↑ Mercenaries Supplemental, p. 68 - "Mercenary Employment Roster (Deployment as of 1 September 3067)"
↑ Jihad Secrets: The Blake Documents, pp. 21-22 "Jihad: The Early Years - OPERATION: “Überschatten/Broken Fist” - Überschatten - Turning Point"
This page was last edited on 27 February 2019, at 06:01.